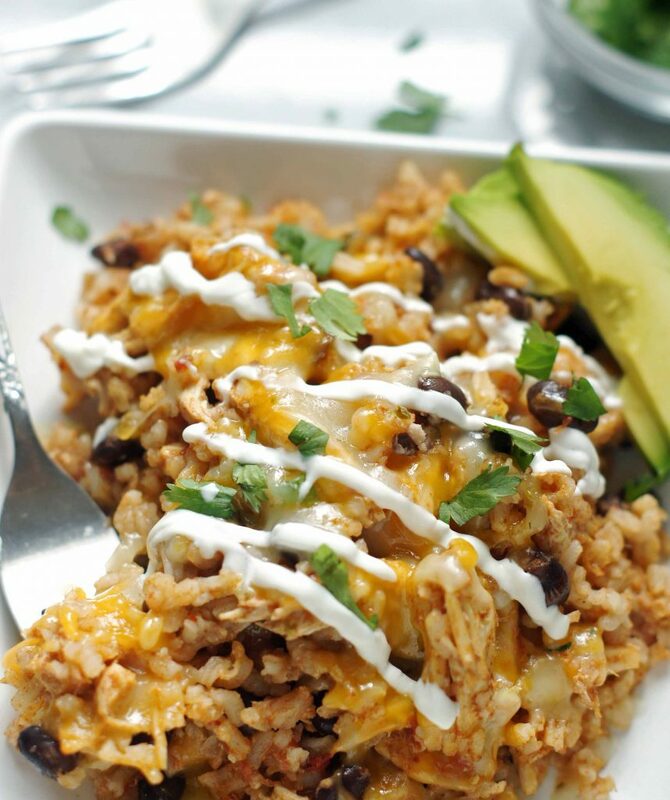 This Slow Cooker Spicy Chicken & Rice is simple, packed with flavor, has just a bit of a kick and perfect for any weeknight meal. Oh my heck! My son Braydon and I got caught in a torrential downpour yesterday. If you live in Salt Lake, you know what I’m talking about. Braydon and I were out running errands and the rain started to lightly fall and within seconds it was dumping rain and then hailing. I thought for sure the hail was going to crack my car windows it was hitting so hard. We pulled up to the store we needed to go into and I told Braydon I was not about to get out. He waited for a minute and said he was making a mad dash for it. I eventually did to when I could see the rain was not about to let up. It was crazy and we were laughing so hard. Our shoes were drenched from the huge puddles in the parking lot, our hair was dripping and we were a sopping wet mess. . . we were quite a sight! It’s June my friends and we had to turn the heater and seat warmers on in the car because we were so cold from being wet. 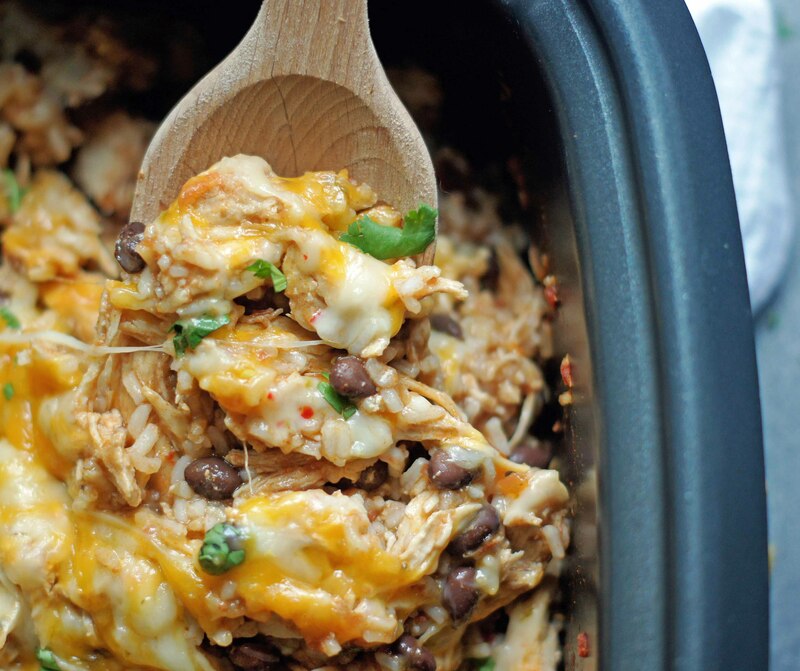 Thankfully this Slow Cooker Spicy Chicken & Rice was at home waiting for us. It was the perfect comfort food for a cold, rainy miserably wet day. 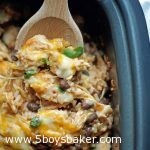 You know how I love slow cooker meals and this one is ranking at the top of my favorite list right now. I made this a couple weeks ago and we liked it, but thought it could use a few tweaks, so that’s what I did. My boys went crazy for it. My oldest son Josh was staking claims on the leftovers to take to work and Taylor inhaled a HUGE plate of it in about 58.3 seconds. To say we all loved it is a bit of an understatement. You could easily use this for tacos, or burritos, but honestly, it’s fantastic on it’s own. . . no shells even required. Place chicken in a 4- or 5-qt. slow cooker. In a large bowl, combine the tomatoes, enchilada sauce, garlic powder, paprika, salt, cumin and chipotle pepper; mix well and pour over chicken. Cover and cook on low for 3-4 hours or until chicken is tender. Remove chicken to a plate and shred using two forks. Return chicken to the slow cooker. Add cooked rice and beans and stir well. Sprinkle cheese evenly across the top and cover. Let heat through about 20-30 minutes. Garnish sour cream, cilantro and avocado, if desired.. If you want to keep the "spicyness" down then use mild Ro-tel and mild enchilada sauce. You can use any combination of cheeses, but I highly, highly recommend using sharp and pepper jack, it's so good! When you dump the shredded chicken back in, it may seem like there is too much liquid, but after you add the rice and beans, the rice absorbs the excess liquid, so don't drain any of the liquid off. The chipotle pepper in adobo sauce comes in a can, you can find it down the Mexican food aisle. Because you don't need the entire can, I chop up what I need and then put the rest of it in a Ziploc bag and freeze it. Then when I need it for other recipes or when I make this again, I cut of a chunk off and chop it up. Make sure you pour the entire contents of the can into the bag, sauce and all. Please make sure you use smoked paprika, it makes a huge difference in the flavor of this dish. Also, don't try and leave out the chipotle pepper, it also adds a smokiness and makes this dish so delicious. For a little more kick and smokiness, go ahead and add a little more of the chipotle pepper in adobo sauce. Yum!! This looks so tasty with all the ingredients we love…I’m pinning! Oh man, this looks YUMMY!! Do you think the chicken would dry out terribly if I were to leave it on low while at work? I love crock pot recipes for work days so that when I get home, it’s ready to go! This would be awesome – all I’d have to do is whip up some rice! I think that depends on how “hot” your slow cooker cooks. I know the newer slow cookers cook so much higher (even on low) than older ones. Chicken does tend to dry out but it’s worth a shot. Does your slow cooker have a timer that you could set and then have it switch to “warm” once the cooking time is over? You could also start with frozen chicken breasts which would take longer to cook so if you cooked this on low all day they would certainly be done in time and may not be dried out. Give it a try and let me know. I just know that my chicken was done after 3 hours in my slow cooker so I just turned it to warm for a few hours until we were ready to eat. Or maybe try bone in chicken? I have a 7qt cooker will it still come out the same ? Hi Elizabeth, slow cookers work the best when they are 2/3 to 3/4 of the way full. If your slow cooker isn’t full the food will just cook faster so just watch it so it doesn’t overcook. Another option is to insert an oven-safe dish into your large slow cooker and add the ingredients into the dish. This makes a smaller cooking vessel inside of your slow cooker. Then cover and cook like normal. So do you cook the rice separate and then add it to the slow cooker? Yes Caroline, you add cooked rice to the slow cooker in the end. Do you cook the beans separate too??? Hi Amber, you don’t need to cook the canned beans, just add them at the end when you add the cooked rice to the chicken mixture. Thanks for looking. What is chipotle pepper in adobo sauce? Is this something I buy that’s already together? Sounds yummy!! It comes in a can and it’s in the Mexican food section of most grocery stores. 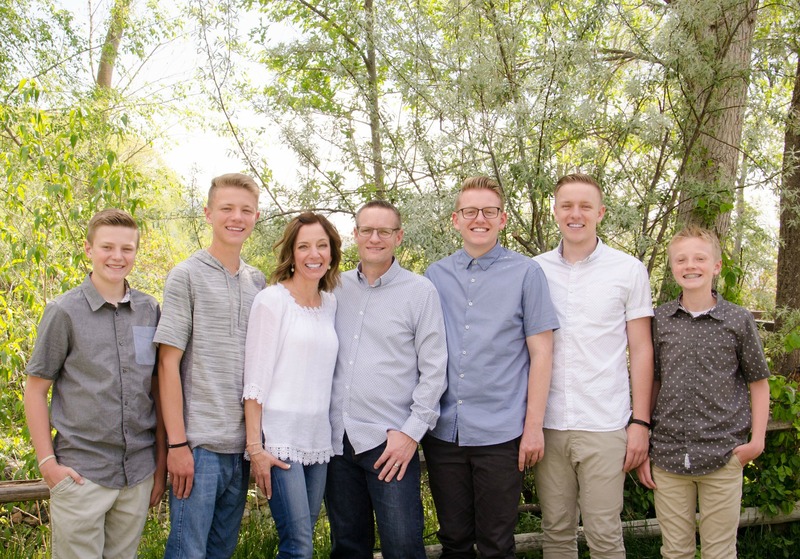 Here is a link that will show you what they look like. If i don’t have the chipotle peppers and want to make it for tonight, will it mess up the recipe or can I skip? Hi Jessica, honestly the chipotle peppers are what give this dish such a delicious flavor. You certainly can leave them out, but you won’t have the “smoky flavor” and little bit of kick the peppers give. All other recipes I’ve made for shredded chicken in a slow cooker have me cook it on High for 3-4 hours, not low. Will a low temp cook the chicken fully? I never cook chicken on high in my slow cookers. I think chicken tends to dry out easily so I always cook it on low and yes, it is fully cooked. All slow cookers are different, so just check yours and if you feel like it’s not fully cooked after the 3-4 hours, cook it a little longer. I made the recipe as is and it was delicious! I added a little stock to the leftovers because it turned a bit thick after cooling and I didn’t want it to dry out for lunch tomorrow. But overall the recipe had great flavor. I will definitely make this again. Thanks Jodi! Thanks Meredith! I’m so glad you loved it. It’s one of our favorites. Hi Jodi – do you use one 14.5 ounce can of tomatoes or two? It says one, but then 14.5 ounces each which made me think maybe two? Thanks! It is one can, sorry if that was confusing. I fixed it so it doesn’t say each. Thanks Jen. Hi Kim! I have never frozen this, but I’m sure you could. It’s definitely worth trying. Does anyone know how many cal/cup? Yes you can replace the Rotel with a can of diced tomatoes and green chilies. That’s a bummer your family hates beans, but you could certainly leave them out. Thanks for looking. How much chicken or what size chicken breasts did you use? Are the 4 breasts equal to a pound or 2 pounds? Hi Katherine, the chicken breasts I use are medium-large in size, probably closer to 1 1/2 – 2 pounds of chicken. What ever size you use will be just fine, it will just determine how much shredded chicken you end up with in the dish. How do you think this would taste with ground beef instead of chicken? I think it would definitely be worth trying! I’m sure it would taste delicious. I would precook the ground beef before I add it to the slow cooker. Let me know if you give it a try. Should the chicken be thawed or frozen when put in the crockpot? Hi Amanda! It doesn’t matter if the chicken is frozen or thawed. I’ve used it both ways. Thanks for looking. How much longer should it cook if the chicken is frozen? Hi Erin! It just depends on your slow cooker, with my slow cooker it only takes about an extra hour to cook frozen chicken breasts. Just keep an eye on your chicken so you don’t overcook it. Is it red or green enchilada sauce? Do you think green enchilada sauce would work? You could certainly try it. It will definitely give it a different flavor but I bet it will still be delicious. Let me know if you give it a try. Hi Dianne, you chop up the pepper also. It’s not too spicy, I promise. The adobo peppers really give it more of a smoky flavor. Thanks for looking. Enjoy! Thanks Jodi. I made this today and it was delicious! I was asked why I hadn’t made more. It was perfect for a day like today when it’s snowing outside. I did use the pepper and the dish had just the right amount of kick. Was just too hot to offer my one year old who wants to everything I eat. The only substitute was that I used chicken thighs. Somehow I always dry out chicken breast and thigh meat is always juicy and tender. I also only used sharp cheddar since that was all I had. Thanks for the recipe. I will be making it again this week! Dianne, I loved reading your comment, thank you. I am so happy you and your family loved this. It is definitely a favorite at our house. My boys devour it every time I make it. One last thing. I’m going to double the recipe next time I make it! Do you think I’ll need more time to cook the chicken or the cook time will be the same? No you shouldn’t need to double the cooking time. It may need an extra 30 minutes, if even that. Does a rice cooker work as well for this recipe? Renee, do you mean does it work to cook the whole meal in the rice cooker or just cook the rice in the rice cooker? Hi Jennifer! I honestly don’t know how it would turn out, sorry. It’s certainly worth trying I guess. I can’t wait to try it out! Hubby isn’t a fan of red enchilada sauce, do you think green enchilada sauce will work as well? Hi Jen, you certainly can try it with green enchilada sauce. It obviously will change the flavor a bit, but I’m sure it would still be delicious. Let me know if you give it a try. Hi, thanks for the recipe, it looks delicious. Do you think it would work to just throw the rice in there at the beginning with everything else? You could certainly try it Cora, but I’m not sure how it will turn out. My worry is that if the rice is in there from the beginning, as it cooks it may absorb too much liquid and make this too dry. You could add instant rice for the last 30 minutes on high. Could I use Chipotle powder instead of the sauce/pepper? Hi Tamera, it’s worth trying. I’m sure it would be fine. Can the time be cut in half if turned on high? You can try, I’m sure it would take just half the time. I just don’t like cooking chicken on high because it tends to dry out. Hi Jodi: I am not sure about the chipotle pepper. Do I use all of the adobo sauce in the can + 1 tbls of.the chopped pepper? Going to try this tonight. Looks so good! Hi Dar! You don’t use all of the sauce. Just pull out a pepper along with any sauce that comes out of the can with it and chop it. I then take the rest of the can and dump the peppers and sauce into a Ziploc freezer bag and freeze it. I just cut off frozen chunks of it when I need it other recipes. Hope you love it. Made this tonight and I will definitely be making it again soon! For those who were wondering about cooking on high..I used smaller/thinner chicken tenderloins and cooked on high for an hour or so. Turned it to low for about an hour and a half and the chicken was not dry at all. I ended up only adding about two cups of cooked rice and it was perfect for my liking 🙂 the chipotle peppers in adobo sauce are a must, it makes the dish! This is delicious alone but I like a little crunch so I ate it with tortilla chips. Thanks Jordan! So happy you loved it. You’re so right about the chipotle peppers, they are a MUST!! Take care. Do you think you could cook it in an electric pressure cooker? Hi Sandy! You could certainly try, I’m sure it would work. I just bought an InstantPot a couple months ago, so I’m still trying to really learn how to use it. If you try it let me know and I’ll do the same. Hi, I am cooking it right now in my Instant Pot-there is sufficient moisture in the ingredients to just use the Poultry setting (15 minutes high pressure). My chicken breasts are thawed, and I cut them in half lengthwise. Great! I’d love to hear how it turns out. My husband is not a fan of tomatoes. Do you think it would be ok to leave them out of the recipe or do you have a recommendation for a substitution? The Ro-tel tomatoes are what give this dish great flavor and a little bit of a kick. A couple of my boys don’t like tomatoes either so I just throw the Ro-tel in the blender before adding them and they gobble this right up. There’s no chunks of tomato that way, it works great. Is there any way I could cook this in the oven to make things faster for like a last minute dinner? Hi Grace, you could absolutely do that. You could either start with cooked chicken and mix everything together and bake it until warm and bubbly. Your could also combine the uncooked chicken with the listed ingredients and bake in your oven and then shred the chicken when it’s done, add the rice and beans and sprinkle with cheese and return to the oven to melt the cheese and heat through. Tried this tonight on stove top. Came out great!!! Thanks for letting me know. I’ll have to give it a try. Jodi the rice always seems to get mushy each time I make this its delicious and I love it any secret tips on how to make it less mushy? I use cooked minute rice when I make this and and have never had the rice get mushy. I wish I could say I know why your rice gets mushy, but I’m honestly not sure. Thanks Jeanne! Glad you loved it. Would this work with pre-cooked Stew Meat? I’m not a huge chicken fan but I really want to try this. The leftovers (if there are any) would make amazing burritos! You could certainly try it! Let me know how it turns out if you do. I made this last night and it was amazing!!!!! We are going to save the rest of what we didn’t add rice to for quesadillas!!! Thank you for your awesomeness! Thanks Leanne! I’m so happy to you loved this. What a great idea to use it for quesadillas. I am definitely going to have to try that. Take care. Just made this for dinner tonight! Chicken was so easy to pull apart (did the recommended 3 hours on low). My only addition would be to add a bit more salt and a bit more of the spices. Overall the dish was a little bland before the cheese and sour cream. I’d maybe even add in an extra chipotle pepper. Hi Shannon. I’m sorry to hear you thought this was a little bland. I think you’re the first reader to think that, but I guess everyone’s tastebuds are different. I’m honestly wondering if you left something out because I have friends and neighbors tell me all the time they love this and love the flavor, but like I said, everyone has different tastebuds. I do think an extra chipotle pepper would be delicious and give it an even smokier taste. Take care. i made this last night and my husband was tearing it up! we ate again for left overs tonight and it was still just as good. we put it on tortillas and made quesadillas! how long do you think leftovers will keep? 🙂 thanks for the recipe! Hi Rachael! I’m so happy to hear you love this. What a great idea to use it for quesadillas. I would think the leftovers would be good for several days. We usually devour this in one meal, and if there has been any leftovers, it’s just been enough for lunch the next day for one of us. But I have had similar dishes that have kept in the fridge for 4 to 5 days and still tasted great. Thanks for letting me know you loved this. I found this recipe last year after my Fiancée and i started living together. We both work in food service and have opposite shifts so getting dinner ready every night can be a challenge. We have used this recipe several times now. I get it set up in the crockpot when i leave for work, when i get home he cooks the rice and adds then everything else before he leaves for work. Voila dinner! Hi Heather! I’m so happy you found this recipe and that it works for you! Thanks for letting me know!